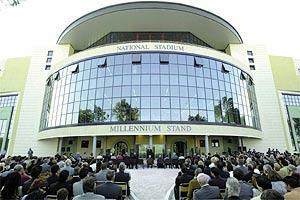 September 3, 2002 will be etched in letters of gold in the annals of the Malta FA as the date when the Millennium Stand, one of the association's biggest projects ever, was officially inaugurated. Several distinguished personalities, most notably the President of Malta Professor Guido de Marco, Archbishop Msgr Joseph Mercieca and Parliamentary Secretary for Sport Jesmond Mugliett, yesterday afternoon converged on the Ta' Qali national stadium for the much-anticipated inauguration of the Millennium Stand, the brainchild of current Malta FA president Dr Joe Mifsud. The sparkling Millennium Stand replaces the East Stand which had been declared a dangerous structure several years ago and had to be demolished. The first phase of the project may have taken a number of years to complete and may have stirred a bit of controversy within the association itself, but the new construction, with its glass façade, is certainly an impressive sight to behold. President de Marco, who presided over yesterday's inauguration ceremony, praised the MFA's efforts to strengthen the sporting culture in our islands. "We have to strive to boost the sporting culture in our islands and the MFA is certainly doing its part. Even if our efforts do not reap immediate dividends, future generations will definitely benefit from the work of their predecessors in years to come," de Marco said. The President was also fulsome in his praise of the MFA president, whom he described as a leader who knows how to bring the best out of the individuals around him. A beaming Mifsud said his association had to go to great lengths to complete this project. "The new stand has been called the Millennium Stand because we were on the threshold of a new millennium when the association began to draw up concrete plans for the reconstruction of this side of the national stadium. "However, it must have been 10 years ago when this project was first discussed," Mifsud said during yesterday's ceremony. Mifsud described the Millennium Stand, which is estimated to have cost Lm3.5 million, as the biggest infrastructural project ever undertaken by the Malta FA. The MFA boss said the Millennium Stand, apart from its spectator terraces with all ancillary facilities, will also incorporate several other amenities such as a swimming pool, gymnasium, restaurant, squash courts, small-weapons range etc, which can be run on a commercial basis. According to Mifsud, the pool and gymnasium should be ready for use by the end of this year. Also present for yesterday's inauguration ceremony was Duncan McLean, an associate in Miller partnership, a Scottish firm of architects, whose expertise in the construction of new stadia was called on by the Malta FA when it was in the process of drawing up plans for the Millennium Stand. Mugliett, the Parliamentary Secretary for Youth and Sport, said the government's decision to award legal titles on premises to local sporting bodies has certainly contributed to a marked improvement in facilities over the last few years. "Sporting associations showed a great willingness to invest in their facilities once they were granted a legal title on their premises and football has been one of the main beneficiaries, what with the renovation of so many pitches across the islands. "The Malta FA has certainly led by example by investing millions of liri in new facilities. Such commitment entails courage and vision but the MFA, spearheaded by Mifsud, has proved that it is made up of people who are truly committed to raising the standard of the game of football in every aspect," Mugliett said. Inter vice-president Giacinto Facchetti also attended yesterday's inauguration ceremony. A Malta FA selection lost 2-0 to Inter in yesterday evening's Millennium Stand inauguration match.